BRUSSELS, Belgium -- NATO released satellite photographs on Thursday showing Russian military equipment, including fighter jets and tanks, that it described as part of a deployment of as many as 40,000 troops near the border with Ukraine. The release came the same day that President Vladimir V. Putin reiterated a threat to curtail gas sales to Ukraine. 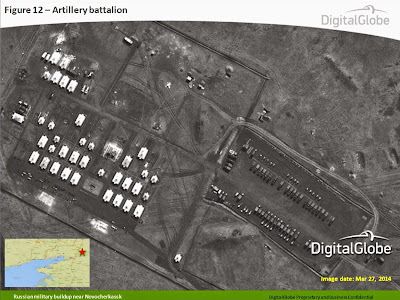 The photographs, taken by a commercial satellite imaging company called DigitalGlobe, offered some of the first documentary evidence of a military buildup that the West says Russia could use to invade Ukraine at any moment. They were released at a news conference in Belgium by Brig. Gary Deakin, the director of NATO’s Comprehensive Crisis and Operations Management Center. The Kremlin has accused the West of exaggerating Russia’s military presence along the Ukrainian border and has insisted that it has no plans for a second military incursion after its lightning-quick occupation and annexation of Crimea. Still, Russia has warned that it may take military action to protect ethnic Russians in Ukraine if they are threatened. Officials said they had distributed commercial photographs, rather than pictures taken by military satellites, because of the complexities of declassifying classified images. The United States government has a contractual arrangement with DigitalGlobe, based in Colorado, that allows images taken by the company to be shared among federal agencies, as well as with American allies. DigitalGlobe sells satellite photographs from all over the world, of sites of cultural interest as well as of military and geopolitical subjects such as a parade in the North Korean capital, Pyongyang, in 2012. A spokeswoman for the company declined to comment on Thursday. President Obama and other Western leaders have said that Russia has massed troops and equipment along its borders and have demanded that the Kremlin withdraw those forces. The top NATO commander, Gen. Philip M. Breedlove, said in an interview last week that Russia’s 40,000 troops could attack on 12 hours’ notice. At the news conference on Thursday, Brigadier Deakin said the photographs showed a menacing force. “The Russians have an array of capabilities, including aircraft, helicopters, special forces, tanks, artillery, infantry fighting vehicles,” Brigadier Deakin said, according to a NATO news release. The photographs were taken between March 22 and April 2. 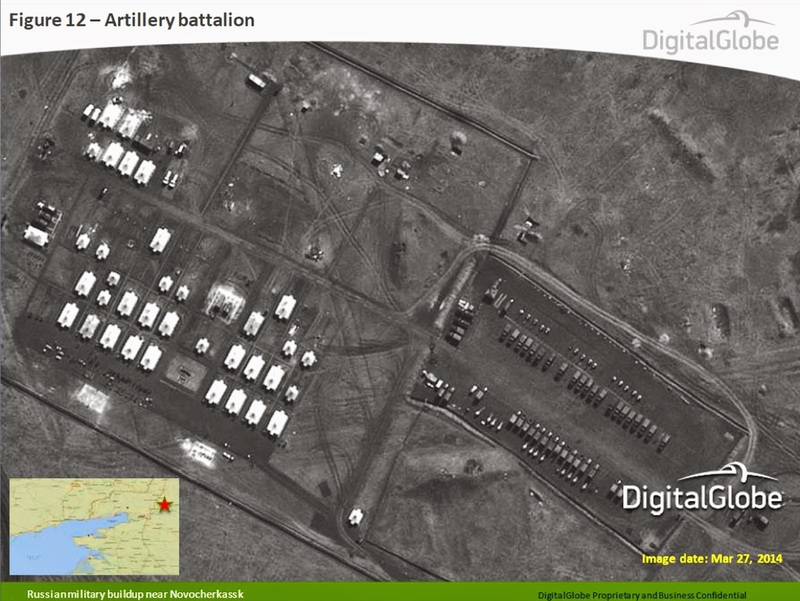 One image shows more than 20 helicopters near the Russian city of Belgorod, about 25 miles from the Ukrainian border. Other images were taken farther from the border, including at Yeysk and Primorsko-Akhtarsk, across the Sea of Azov from Ukraine. In addition to accusing the West of exaggerating Russia’s military presence, the Kremlin said on Thursday that any stationing of NATO troops near Russia’s borders would be a violation of international agreements. In a letter to European leaders on Thursday, Mr. Putin warned that Russia would probably start forcing Ukraine to pay a month in advance for natural gas or risk being cut off. He said in the letter that Russia had worked aggressively in recent years to support Ukraine financially, and he accused the West of exploiting Ukraine and damaging its economy. “To a large extent, the crisis in Ukraine’s economy has been precipitated by the unbalanced trade with the E.U. member states, and this, in turn, has had a sharply negative impact on Ukraine’s fulfillment of its contractual obligations to pay for deliveries of natural gas supplied by Russia,” Mr. Putin wrote, referring to the European Union. He noted that Russia had offered Ukraine billions of dollars in loans. “What about the European partners?” Mr. Putin asked. Mr. Putin said the West’s refusal to take Russia into account had left the Kremlin no choice but to demand advance payment for gas. A cutoff could threaten Europe, he added, if Ukraine tried to siphon off gas passing through its territory. Europe receives about 13 percent of its gas supply from pipelines running through Ukraine, though it has worked in recent years to reduce that dependence.